Internet Relay Chat (IRC) is a form of real-time Internet chat or synchronous conferencing. It is mainly designed for group (many-to-many) communication in discussion forums called channels, but also allows one-to-one communication via private message and data transfers via Direct Client-to-Client. 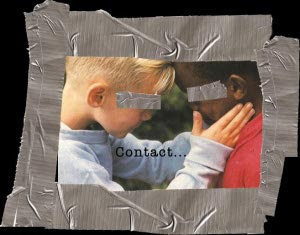 Meanwhile, Instant Messaging (IM) is a form of real-time communication between two or more people based on typed text. The text is conveyed via computers connected over a network such as the Internet. I have here a long list of excellent free and open source IRC and IM desktop clients that you may want to try out. *Kopete is an instant messenger supporting AIM, ICQ, MSN, Yahoo, Jabber, IRC, Gadu-Gadu, Novell GroupWise Messenger, and more. It is designed to be a flexible and extensible multi-protocol system suitable for personal and enterprise use. Work on ChatZilla progresses, and ChatZilla is currently included with the Mozilla Application Suite and SeaMonkey as well as being available for Mozilla Firefox as an optional extension. It is also available as a standalone version which runs on top of XULRunner. *ircII is a Unix IRC client that is made available completely free of charge, and is available in source form. It is the oldest IRC client still maintained. Its initial release was in the late 1980s, soon after the invention of IRC. Several other Unix IRC clients, including BitchX, EPIC, and ScrollZ, were originally forks of ircII. *Irssi is an IRC client program originally written by Timo Sirainen, and released under the terms of the GNU General Public License in Jan 1999. It is written in the C programming language and in normal operation uses a text-mode user interface. Irssi was written primarily to run on Unix-like operating systems but also runs under Microsoft Windows, using Cygwin. Irssi can also be compiled and run under Windows natively, but doing so removes many of its useful features. Unlike some text mode IRC clients, Irssi is not based on the ircII code, and was written from scratch. This freed the developers from having to deal with the constraints of an existing codebase, allowing them to maintain tighter control over issues such as security and customization. Numerous modules and Perl scripts have been made available for Irssi to customise how it looks and operates. *Pidgin is an instant messaging program for Windows, Linux, BSD, and other Unixes. You can talk to your friends using AIM, ICQ, Jabber/XMPP, MSN Messenger, Yahoo!, Bonjour, Gadu-Gadu, IRC, Novell GroupWise Messenger, QQ, Lotus Sametime, SILC, SIMPLE, MySpaceIM, and Zephyr. 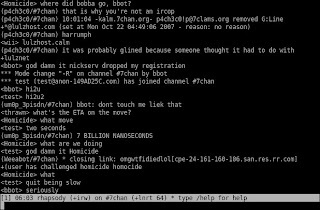 *BitchX is a free IRC client. The initial implementation, written by "Trench" and "HappyCrappy", was a script for the IrcII chat client. It was converted to a program on its own right by panasync (Colten Edwards). BitchX 1.1 final was released in 2004. It is written in C, and is a console application. A graphical interface is also available, which uses the GTK+ toolkit. It works on most Unix-like operating systems, and is distributed under a BSD license. It is originally based on ircII-EPIC and eventually it was merged into the EPIC IRC client. It supports IPv6, multiple servers and SSL, but not UTF-8. BitchX (often called just "BX" by fans) is well known for its unique default of sending random messages on a /quit. *KVIrc started as an alternative IRC client for KDE under GNU/Linux by Szymon Stefanek. The project has undergone major re-writes in its history and is now available on Microsoft Windows and Mac OS X. It is licensed under the GPL. It supports simultaneous connections to multiple servers, SSL connections to servers, UTF-8, IPv6, as well as the SDCC protocol. It also has many scripting abilities, and is very easy to configure. *naim is a minimalist messaging and chat program written by Daniel Reed in C; it supports the protocols AIM, ICQ, IRC, and lily (CMC). Unlike most messaging clients, it is not graphical; it runs from the console using the ncurses library. naim is free software, licensed under the GNU GPL. naim uses the AOL instant messenger TOC protocol instead of the OSCAR protocol because the TOC protocol is less likely to change and is better supported by AOL. This means naim lacks some features other instant messengers have. For example, earlier versions of naim lacked the ability to check other people's away messages, though the latest version of TOC and naim now support this feature. Even though TOC may have a smaller feature set, naim is theoretically more stable than OSCAR-based clients since those clients use a reverse-engineered protocol which AOL may change without notice. 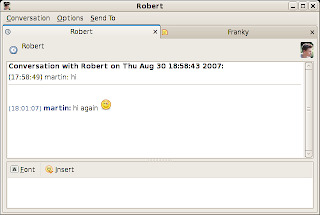 *Konversation is an Internet Relay Chat (IRC) client for KDE (K Desktop Environment). Konversation is currently maintained in the KDE Extragear module, which means that it has its own release cycle independent from KDE's. 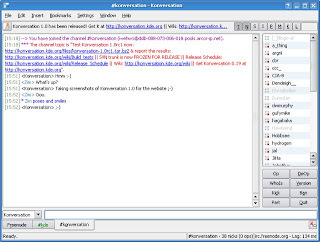 Konversation is free software released under the GPL. 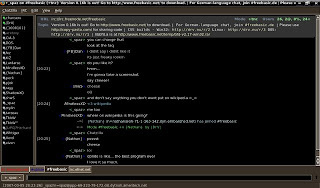 *XChat, commonly written X-Chat or xchat, is one of the most popular IRC clients for Unix-like systems. It is also available for Microsoft Windows and Mac OS X (via an offshoot of the project, called X-Chat Aqua, which keeps in sync with the main development branch and is much more popular than the official version maintained by the Fink project). It has a choice of a tabbed or tree interface, support for multiple servers, and a high level of configurability. Both command line and graphical versions are available, although use of the graphical version far outweighs use of the command line version. It is licensed under the GNU General Public License and uses the GTK+ toolkit for its interface. 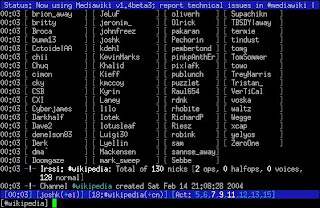 *WeeChat is a light text-mode IRC client. It is extensible by plugins and scripts. There are builds for many Unix like systems and a build for Windows is in progress. 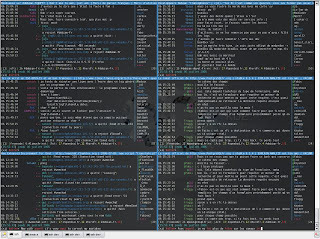 *Rhapsody is a text-mode IRC client program for Unix and Unix-like operating systems. 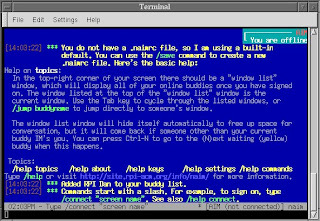 It includes a curse-based text user interface intended to make the program easy to use for beginning and intermediate IRC users. In addition to the basic IRC protocol, Rhapsody supports DCC chat and file transfer, CTCP, and SOCKS proxy servers. There are definitely other free and open source IRC/IM software that I failed to mention above, so if you know some, please share them with us via comment. thats a great software you just reviewed ! merry thanks !